The characteristics common to all clay minerals derive from their chemical composition, layered structure, and size. Clay minerals all have a great affinity for water. Some swell easily and may double in thickness when wet. Most have the ability to soak up ions (electrically charged atoms and molecules) from a solution and release the ions later when conditions change. Water molecules are strongly attracted to clay mineral surfaces. When a little clay is added to water, a slurry forms because the clay distributes itself evenly throughout the water. This property of clay is used by the paint industry to disperse pigment (color) evenly throughout a paint. Without clay to act as a carrier, it would be difficult to evenly mix the paint base and color pigment. A mixture of a lot of clay and a little water results in a mud that can be shaped and dried to form a relatively rigid solid. This property is exploited by potters and the ceramics industry to produce plates, cups, bowls, pipes, and so on. Environmental industries use both these properties to produce homogeneous liners for containment of waste. The process by which some clay minerals swell when they take up water is reversible. Swelling clay expands or contracts in response to changes in environmental factors (wet and dry conditions, temperature). Hydration and dehydration can vary the thickness of a single clay particle by almost 100 percent (for example, a 10A-thick clay mineral can expand to 19.5A in water (Velde, 1995). Another important property of clay minerals, the ability to exchange ions, related to the charged surface of clay minerals. Ions can be attracted to the surface of a clay particle or take up within the structure of these minerals. The property of clay minerals that causes ions in solution to be fixed on clay surfaces or within internal sites applies to all types of ions, including organic molecules like pesticides. Clays can be an important vehicle for transporting and widely dispersing contaminants from one area to another. Clays and clay minerals occur under a fairly limited range of geologic conditions. The environments of formation include soil horizons, continental and marine sediments, geothermal fields, volcanic deposits, and weathering rock formations. Most clay minerals form where rocks are in contact with water, air, or steam. Examples of these situations include weathering boulders on a hillside, sediments on sea or lake bottoms, deeply buried sediments containing pore water, and rocks in contact with water heated by magma (molten rock). All of these environments may cause the formation of clay minerals from preexisting minerals. Extensive alteration of rocks to clay minerals can produce relatively pure clay deposits that are of economic interest (for example, bentonites<primarily montmorillonite> used for drilling muds and clays used in ceramics). The transport and deposition of clays and clay minerals produced by eroding older continental and marine rocks and soils are important parts of the cycle that forms sedimentary rocks. The ancient sedimentary rock record is composed of about 70 percent mudstones (which contain about 50 percent clay-sized fragments) and shales (which are coarser than mudstones but which may contain clay-sized particles) (Blatt and others, 1980). Today, sedimentary environments that contain muds cover about 60 percent of marine continental shelves and 40 percent of deep ocean basins; continental aquatic environments such as lakes, rivers, estuaries, and deltas also contain high proportions of fine-grained sediments (Hillier, 1995, p. 162). Clearly, clays and clay minerals are critical components of both ancient and modern sedimentary environments. Diagenesis is the in-place alteration of a mineral to more stable forms, excluding surficial alteration (which is weathering); diagenesis occurs, for example, when minerals stable in one depositional environment are exposed to another by burial and compaction. Common silicate materials such as quartz, feldspars, and volcanic glasses, as well as carbonates, noncrystalline iron oxides, and primary clay minerals, are transformed during diagenesis into more stable clay minerals mainly by dissolution and recrystallization. The formation of bentonite (beds containing smectite-group clay minerals including montmorillonite) and fuller’s earth (a type of clay mineral deposit that has high capacity to absorb water) may occur primarily by diagenesis, although some deposits may also form by hydrothermal processes. Bentonite beds usually form from altered volcanic ash, but other types of rock may also serve as sources. The absorptive properties of bentonites and fuller’s earth make them ideal for such diverse uses as drilling mud; foundry-sand bond; binder for pelletizing iron ore and bleaching liquids; absorbents for oil, grease, and animal waste; and carriers for pesticides and fertilizers. 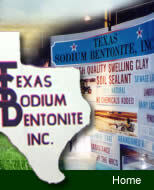 Bentonite is also used as a soil liner for environmental containment applications and with polyacrylamide for making paper.